QuickBooks is often referred to as one of the best or even the best online accounting software for small businesses. It is a flagship product of Intuit, a company known for excellent business and financial solutions, including Mint, the highly popular personal finance software. Therefore, it is needless to say that we had high expectations when we started researching for this QuickBooks review. Here is what we found out while exploring and testing the software, along with our final verdict. QuickBooks is accounting software designed to help business owners handle financial tasks with greater ease and efficiency. It offers excellent tools that allow users to keep track of every aspect of their business, know how much they are making and spending at all times, run reports, invoice and accept payments more easily, track time and inventory, and better prepare for tax time. By subscribing to QuickBooks, users get to have a clearer view of their finances, automatically import and organize their transactions, and deal with all finance-related matters directly from the QuickBooks software. This allows them to spend less time on accounting and get a better sense of how their business is doing even without the help of an expert. QuickBooks offers a variety of solutions for individuals and businesses with different accounting needs. Users can opt for desktop or online versions of the software. With the online versions of QuickBooks, users can access the software from any device and manage their daily tasks more easily. QuickBooks Online allows users to choose from 4 different plans, including both basic and advanced QuickBooks features (for a full overview of the features included in each plan, see the Plans & Pricing section of this QuickBooks review). Apart from signing in to QuickBooks via a web browser, users can also opt for one of the handy apps that promise greater speed and performance. 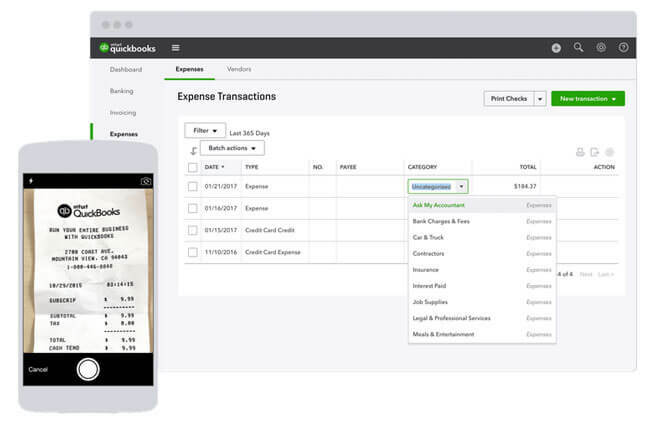 QuickBooks offers desktop apps for Mac and Windows and mobile apps for Android and iOS. Is QuickBooks Right For You? QuickBooks is primarily designed for independent contractors and small businesses. Its accounting solutions are suitable for businesses and self-employed individuals with both large and small client bases. They facilitate time, expense, and bill management and allow users to track their income, expenses, inventory, and sales, increase tax deductions, run reports, send estimates, and more. For large enterprises, QuickBooks offers more advanced, custom-tailored solutions. QuickBooks software is suitable for accountants as well. Accounting professionals can make use of excellent QuickBooks products that suit their needs, both online and desktop, and get to become a part of the ProAdvisor program, which allows them to get support, training, and resources that can help them take their practice to the next level and become QuickBooks-certified. Another benefit accountants get to enjoy is the possibility to get paid in QuickBooks and get special rates available to ProAdvisor members. Additional resources available to accounting professionals include live webinars, virtual conferences, local training, and access to Accountant University that provides free training on tools and products for accountants. 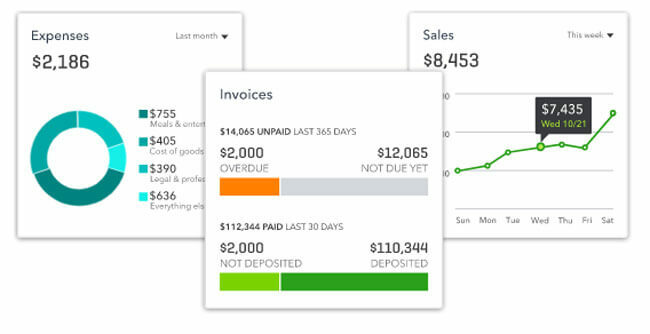 QuickBooks boasts a powerful and even overwhelming suite of features. To make it easier for our readers to better understand the options it offers, we will attempt to provide clear and simple descriptions of all the prominent features of QuickBooks software. One of the basic features currently available to independent contractors only is tracking miles. This feature allows for automatic mile tracking with smartphone GPS and manual categorization of business and personal trips. Another essential feature is tracking income and expenses. Users can import transactions from their bank accounts, credit cards, PayPal, and other financial apps and institutions and automatically sort them into tax-friendly categories. Saving and categorizing receipts is incredibly easy too. By using QuickBooks, users get to maximize tax deductions through smart, year-round organization of expenses into deduction categories, automatic calculation of quarterly taxes, and easier filing with the TurboTax add-on. The software makes it easy to create professional-looking invoices, accept all major credit cards and free bank transfers, accept payments 24/7, track invoice status, send payment reminders, and automatically match payments to invoices. Users can run and export various financial reports, such as profit and loss, budget vs. actuals, A/P and A/R aging summaries, payroll summaries, and balance sheets, and create custom reports tailored to their business. Users can further create and send custom estimates, accept mobile signatures, view estimate status, and instantly convert estimates into invoices. QuickBooks mobile card reader allows users to accept credit cards wherever they are, facilitating the payment process. Connecting to e-commerce tools is equally easy and, what is particularly useful, it is possible to automatically calculate taxes on invoices. Bill management tools include tracking bill status, creating recurring payments, recording payments, paying multiple bills and vendors simultaneously, managing vendors, and printing checks. 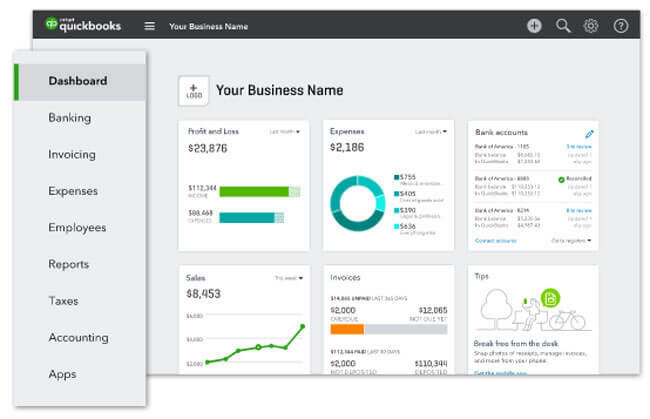 QuickBooks makes it possible to create custom access to the account for multiple users, including accountants, employees, partners, and others, thus enhancing collaboration. With time-tracking tools, users can track billable hours and add billable time to invoices, report on unbilled hours, and track employees’ work hours, which automatically appear on the payroll. The software allows users to track inventory by item and sort taxable and nontaxable goods, have quantities automatically readjusted, get low stock alerts, keep track of vendor orders, and run reports to view top-selling products, total sales, and total taxes. 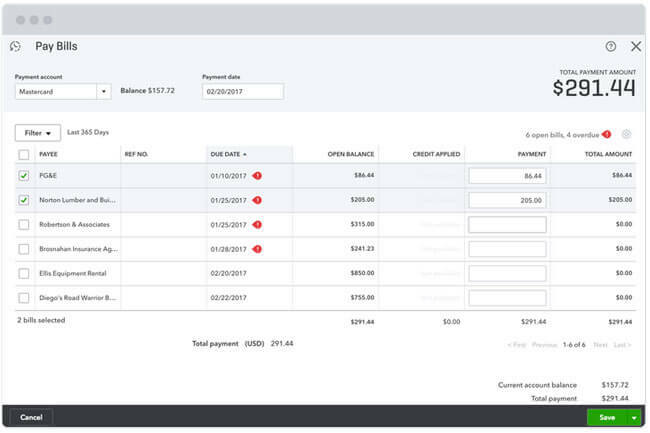 QuickBooks offers the additional advantage of managing 1,099 contractors, with the possibility to purchase 1,099 forms directly in QuickBooks and file the forms online. Finally, businesses in need of a financial boost can apply for QuickBooks Capital loans, have money deposited in 1-2 business days, and pay back the borrowed amount, plus interest, with no hidden fees. While researching for our QuickBooks review, we were happy to see that the service has an excellent resource center filled with all kinds of useful information on numerous relevant topics, including bookkeeping, invoicing, taxes, expenses, and payroll. Users can browse its rich collection of articles, helpful guides, and creative and informative videos featuring advice from various entrepreneurs. What we particularly liked are the tools and calculators available, such as paycheck calculator, self-employment tax calculator, invoice generator, employee cost calculator, and business entity wizard. QuickBooks has certainly done a great job creating a resource center that can be of great help to all of its users. On top of that, it organizes excellent training classes that allow users to learn how to make full use of the software in only two short days of training. QuickBooks Online users can choose from 4 subscription plans. 1 plan is designed for independent contractors and the remaining 3 are suitable for small businesses. The Self-Employed plan was created with independent contractors in mind and it costs $10 per month. It allows users to track miles, income, and expenses, maximize tax deductions, and run reports. The Simple Start plan is the most affordable plan for small businesses and it costs $15 per month. It includes all the features available with the Self-Employed plan, apart from tracking miles, and also allows users to send estimates and track sales and sales tax. With the Essentials plan, users get to enjoy all the benefits available with the Simple Start plan, along with several more advanced features, including bill management, adding multiple users to the account, and tracking time. This plan costs $35 per month. Finally, the Plus plan gives users access to the full set of QuickBooks Online features, including the ones mentioned above, as well as inventory tracking, creating and managing budgets, and managing 1,099 contractors. The price is $50 per month. Unfortunately, with QuickBooks, payroll is not included in the plans but instead comes in the form of an add-on. The price is $39 per month, plus $2 per employee per month. Users who want to get full-service payroll, which includes help from payroll experts, pay $99 per month, plus $2 per employee per month. While useful, this may not be something all small businesses can afford. For users who want to try out the service before purchasing, QuickBooks offers a 30-day free trial, no credit card required. The desktop versions of the software come in 3 forms: Pro, Premium, and Enterprise. QuickBooks Pro comes in two versions, Pro and Pro Plus, with the difference being in the added protection and unlimited support that comes with Pro Plus. With Pro, you pay a one-time fee of $299.95. 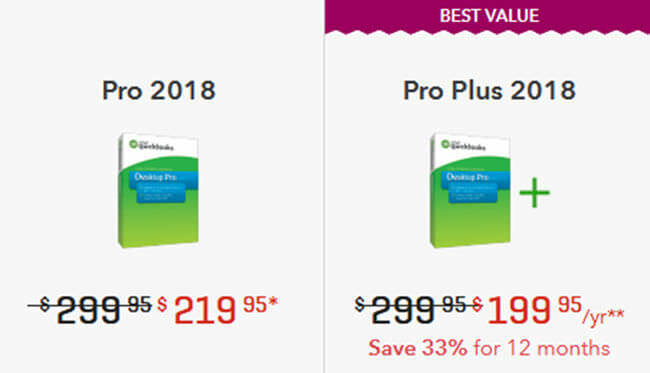 With Pro Plus, the price of the annual subscription is $299.95. What makes QuickBooks Premier superior to QuickBooks Pro is the fact that it offers tailor-made reports for different industries and allows up to 5 users, unlike Pro, which has a 3-user limit. Just like with QuickBooks Pro, you can choose between two options, Premier and Premier Plus, with Premier Plus offering additional benefits, including 24/7 support, data backups, and upgrades. QuickBooks Premier comes with a one-time fee of $499.95 while you pay $499.95 for the annual subscription with Premier Plus. Finally, QuickBooks Enterprise is designed for large businesses and users interested in this version of the software can go over the pricing details and other matters with QuickBooks representatives. The prices start at $1,100 per year for a 1-user license. All desktop versions come with a 60-day money back guarantee. 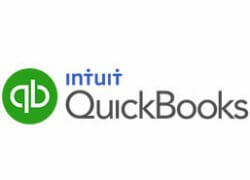 By becoming a QuickBooks user, you agree to allow Intuit, the company behind QuickBooks, to store and use your private information for the purpose of providing you services. Your personal information may be shared with third-party service providers that cooperate with Intuit and enable it to provide services, as well as Intuit affiliates and subsidiaries, as permitted by law. Your data may further be shared with credit bureaus, consumer reporting agencies, card associations, and government agencies under circumstances involving fraud, debt collection or credit. Other than that, your personal information is not shared without your consent; it is safely stored and protected from misuse. Apart from employing advanced security tools in order to protect its users, Intuit also provides plenty of information that can help its users learn more about online security and take measures to protect themselves while using QuickBooks or during any other online activity. The opinions of users and critics do not always match and in the case of QuickBooks, they sometimes stand in pretty stark contrast to each other. What virtually everybody agrees on is that QuickBooks is excellent software that boasts great flexibility and innumerable useful features. However, while many reviewers tend to praise its usability, there are quite a few users who found it difficult to learn how to use the software. Given its complexity and the variety of options it offers, it is quite understandable that some users may experience certain difficulties getting used to the QuickBooks environment. This is something the makers of QuickBooks themselves recognize. Still, the biggest problem for the users who gave negative reviews was the unhelpful customer support. Namely, according to certain user reviews, the support team is not always willing or able to provide adequate solutions, thus leaving users to solve their problems themselves. We have to emphasize that this does not mean that QuickBooks has awful customer support in general or that all users complain about it. It may simply reflect the support staff’s inability to provide solutions that absolute beginners can easily implement. Therefore, we advise users who have no previous experience with accounting software to make use of the free trial and make sure QuickBooks is a good solution for them personally before they invest in a subscription. QuickBooks training classes can also be of use to those who want to learn how to use the software more quickly. 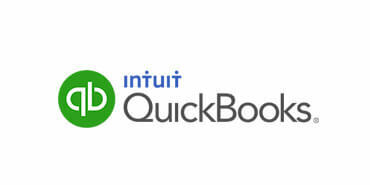 QuickBooks indeed represents one of the best accounting solutions for freelancers and small businesses. Its suite of features covers virtually all the accounting needs of the vastest majority of users. The most affordable plans include all the most important tools and it is easy to upgrade to a plan with more features as your business grows. While the software is complex and offers an abundance of options, the basic tools are easy to use and users can learn as they go or opt for QuickBooks training classes. We can conclude that this software’s stellar reputation is certainly well-deserved. Our ratings are the result of an objective and independent evaluation of QuickBooks , generating the final rating that reflects the overall quality of the company. Ratings may change as the service changes. QuickBooks user rating based on 3 user reviews. Hands down the best there is. Maybe you can’t figure it all out at the first glance, but that’s because it offers so much, don’t give up just because it seems too good for you. Everyone I asked recommended QB and I gave it a try for a month, but apart from sorting transactions and sending invoices, I found it all a bit confusing. Great features but UI could use work. We found 0 verified QuickBooks promo codes for April, 2019. There’s no QuickBooks coupons or discounts right now. If you like QuickBooks but aren’t sure whether they are truly the ideal choice for you, you may want to take a look at our comparisons below to discover if one of their competitors is more suitable for you.